Right click it, change its properties to be whatever you want, ie W:1000 D:800 H:200 and change the colour to the same as the ceiling. White then! Go on to Google Images and get a good high res 2D image of an integrated ceiling extractor and copy and past into your Textures>Misc folder as I've explained before. Drag both objects into their final position. Ive got to get my head around the whole new way of putting the pic's from www to a file on the laptop. Ive got some good size projects coming up and the thing that is letting me down is the renders and my ability to do them. Are you using Windows Prem? Coincidently, I had one to draw up today...... Now, I know I'm no Daz Gizmo and its just a basic render, but hopefully the client will get an idea of what it will look like. Any help or advice or pointers you can offer Daz will be gratefully received! I will not take any offence at all. I had never done a CAD drawing on Articad before the start of December, so it's still a sharp learning curve for me, as you can see. I certainly feel more in my comfort zone with a Plunge saw in my hands rather than a computer mouse...!!! 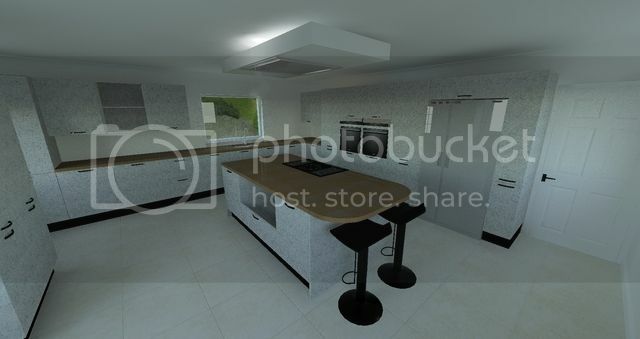 I'm not an Articad user and definitely I'm no Daz but I would always say that the crucial part of planning a kitchen is making it sure it fits in the 2D mode. I try to send my clients a handful of images that show an area at a time instead of trying to cram the entire view into one image. Make sure you pull the image round so that all the angles are at least, give or take, 90 degrees to each other. Much in the same way you would actually install a kitchen!! 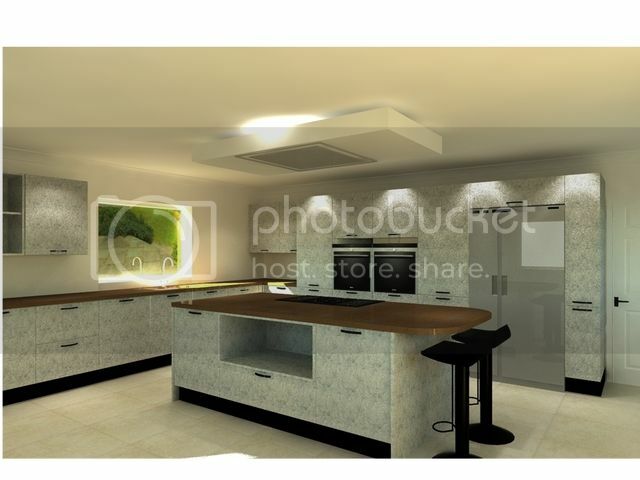 The image I showed above is not even a kitchen that I'm designing at the moment. It was just one I was messing around with on a Bank Holiday weekend and trying new ideas to stretch the capabilities of Nexus. I will post more images from that design tomorrow from different angles when I get on my PC. Yeah... As Stretch Mentioned, try to avoid trying to get more in the render by increasing the field on view.... I try not to alter the default as this is close to what looks more natural. The default light I nearly always change it's value to zero when trying to get a good render. Turn on the Sun as I think so many renders look "empty" with just the sky rays. Not finished with it yet as i am still learning how to tweak the settings. The door finish is supposed to be natural concrete, but it still looks a bit Grey, but in reality there is more of a Brown in it. Current time: 25-04-2019, 07:40 AM Powered By MyBB, © 2002-2019 MyBB Group.